One of the many things I love about blogging is the fact that I can reach you guys from just about anywhere (as long as I've got a WiFi connection!) And today that somewhere is Disneyland! I'm here with my mom and younger brother, since it's become sort of a tradition to take a trip "just the three of us" before back to school/work time. Now although it's the land of churros, ice cream treats, and corn dogs... I'm still managing to eat pretty clean. There are actually a ton of healthy options, especially at the sit-down restaurants. But with the number of "steps" we get in trekking it back & forth between Disneyland and California Adventure... I wouldn't feel too bad if a corn dog or Dole whip snuck onto the menu! One thing I actually look forward to after a vacation, besides reuniting with Dathan & the pets, is definitely getting back to a clean eating routine. Although it can get monotonous at times, I do love some structure in my life - especially when it comes to breakfast foods as my first meal of the day. 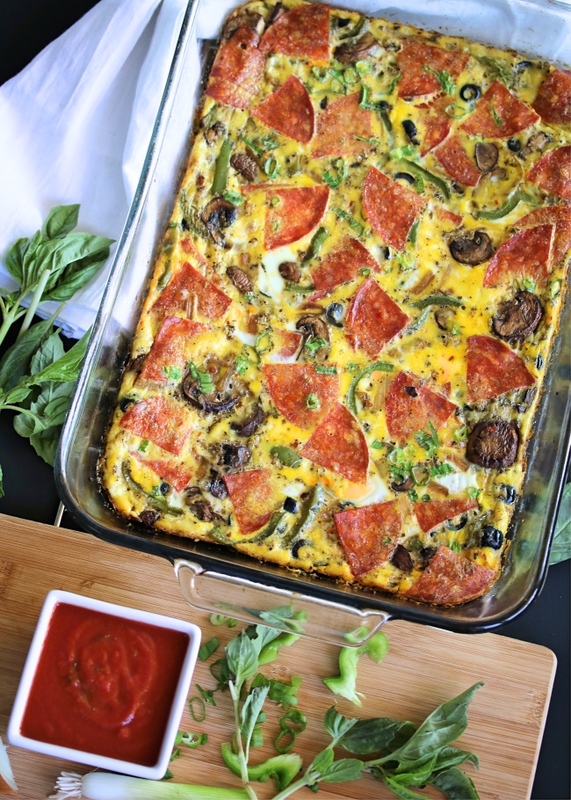 I've been making a version of this Pizza Frittata for some time now, because you all know: I like pizza. And while I have Paleo-fied tons of pizza inspired recipes over the years, I hadn't tackled a breakfast dish until recently. There's just something about that "combination" flavor profile: sautéed veggies, savory meats, plenty of garlic, and you guessed it - pizza sauce! 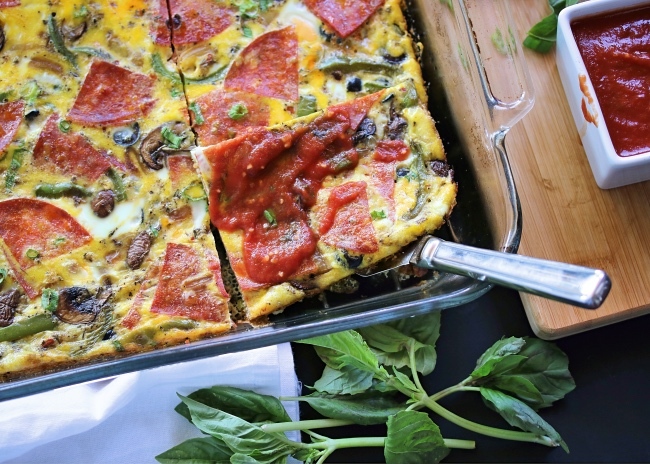 It "makes it" for an actual pizza, and is the same here for this frittata. It just finishes off the breakfast bake perfectly. I hope you enjoy getting ALL the pizza feels - for breakfast! 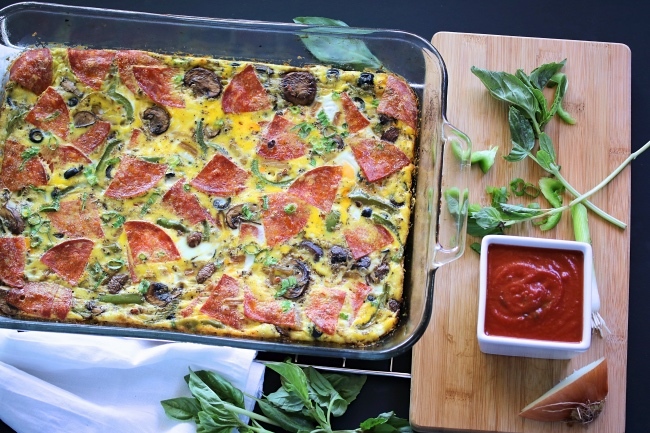 - with this Paleo friendly, *Whole30 compliant*, pizza frittata. Enjoy! In a large skillet over medium heat, sauté the bell pepper, mushrooms, onion, and minced garlic for 5 minutes to soften. Stir in the olives and chopped pepperoni. Scoop the mixture into the greased baking dish, spreading evenly along the bottom. In a large bowl, whisk the eggs, milk, and spices until combined. Pour the egg mixture over the meat and vegetables. Transfer the baking dish to the preheated oven, and bake for 25 to 30 minutes or until the eggs are set. Meanwhile, make your pizza sauce by combining the tomato sauce, basil, garlic, oregano, and red pepper flakes in a small bowl. Season with salt & pepper to taste. Heat it over the stovetop on low or in the microwave, until warm. 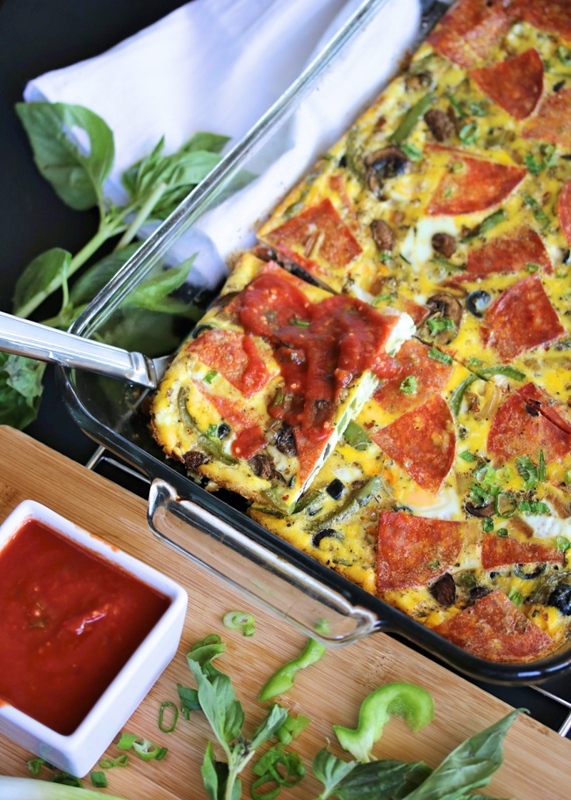 Slice the frittata into 8 pieces & serve topped with pizza sauce. If you're making this on a Whole30 and cannot find compliant pepperoni, feel free to substitute fully cooked compliant sausage or prosciutto. Ground beef would be tasty too! This is a super hit recipe. Thank you soo much for sharing it with us. I am these days making it once a week and my family still wants more. Super yummy and perfect recipe. Hi. I made something similar once (maybe this recipe) but then later realized my pepperoni, while uncured, was not sugar-free, thus not Whole 30 compliant. I keep looking at Whole Foods but can't find any without sugar. Do you know of a no-sugar pepperoni for Whole 30? Thank you.